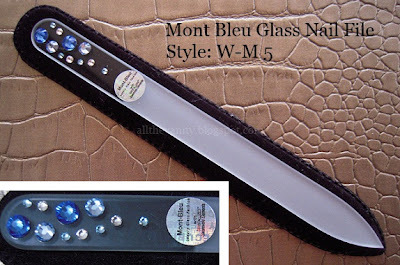 My first encounter with a glass nail file occured a little while back: I was perusing the nail product isles in one of my frequent beauty shopping trips and I spotted some mini Bourjois glass nail files sitting in a corner. I figured Bourjois is a respectable brand, so, naturally, I picked one, only to find out that I had made one of the worst beauty purchases ever: the nail file lost the roughness of its filing surfaces after only 3 (!) uses. I threw it to the bin and swore off glass nail files there and then. But when a Czech company called Mont Bleu contacted me to review their glass nail files, I thought I'd give them another chance - I was still curious as to why so many people were recommending glass nail files instead of the regular emery ones, on twitter and other beauty sites. Perhaps they knew something I didn't? Apparently they did, because after a few weeks of testing out this product, I only have the best things to say about it! For starters, the filing surfaces have remained intact after all this time - I inspect them closely after each use, but they're still as good as new! It's biggest advantage though is how gentle it is to my nail: the filing is sharp and precise and the tip of the nail feels a lot stronger afterwards in comparison to a classic emery board. I've also noticed that it benefits my brittlest nails too, since the peeling hasn't progressed any further as it normally would! Score! Yep, this little item is a regular in my nailcare routine and I'd be mildly devastated if I dropped it or mishandled it in any way (the site claims that they're almost unbreakable, but I wouldn't wanna find out regardless)! But I wouldn't be doing it justice if I didn't talk about its lovely design, now, would I? I'm sure you've noticed the beautiful Swarovski detailing on one end: it screams "luxury"! The design of my file is the W-M no. 5 but if you take a look through their online store, I'm sure you'll spot many designs to suit your taste! What's more, Mont Bleu states that the polishing surfaces have a life-long guarantee, without you having to take any special care of them: you can clean them by washing them, putting them under a uv lamp, even boiling them! A beautiful product of excellent quality, what more can you ask for? It would make a lovely little present too imo, since I don't think Swarovski encrusted nail files are that easy to come by! I remember a long time ago I read about a glass file on makeupalley (had never heard of one before)..everyone was raving about it! Needless to say I'd since forgotten all about glass files until this lovely post of yours! I definitely need one in my life now :) And the one you have is beautiful! oooh, exciting stuff. I haven't tried them yet,as i had't found a good brand who made them. I know you're a fan of make up, so i'm sure you've hear the latest Yiannis Marketakis news about Make Up Lab? Deets on my last post girl. Πριν ενα χρονο περιπου μου εφερε η μαμα μου μια γυαλινη λιμα,οχι τοσο ομορφη οσο η δικη σου αλλα ειναι κ αυτη χαριτωμενη..
Απο τοτε λοιπον δεν εω χρησιμοποιησει αλλη,ειναι κλασης ανωτερη απο τις κλασσικες! P.S Τι ομορφα νυχια που εχεις! Κ τελειο χρωμα το βερνικι,ποιο ειναι? I am so addicted to glass nail files! I have a blue/silver one from Hondos :P Love your nails! Which nail polish do you have on ? I have tried some and like them to be honest! !This one loooks so special! !Thanks for the review hun!Going to check!! 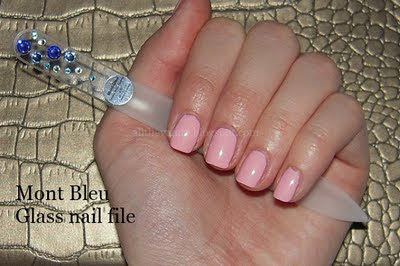 I like glass nail files, I have a mini one from Essence and works great. This one looks so luxurious, lovely!! @Artemi: Κι εγω τωρα καταλαβαινω τους ενθουσιασμενους με τις γυαλινες λιμες - they were right!!! Το βερνικι ειναι το Van D' Go της Εssie!